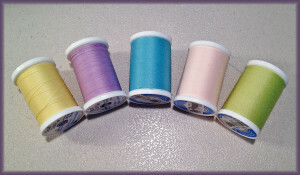 There are many sewing products that are essential, or will make your life easier. Before you rush out to buy these items, however, there’s a few things you should know. This may seem an odd thing to list here, but I’ve had many students go out and buy an expensive sewing machine before they knew what they really needed. Don’t jump into the deep end—do a little research first! Questions to ask: Do you want a mechanical or computerized machine? What kind of sewing will you use it for? How often will you sew? Which stitches will you need? Are there any special features you’d like, such as speed control or a top-drop bobbin? Once you’ve narrowed your search, read reviews. Amazon is a great place to find out what other customers think of a certain product, even if you end up buying it elsewhere. Also, be careful where you buy your new sewing machine. Fabric stores have been known to charge double what you might pay at Amazon. Dealers can be expensive, too, but you might be able to get a refurbished secondhand machine for less money. 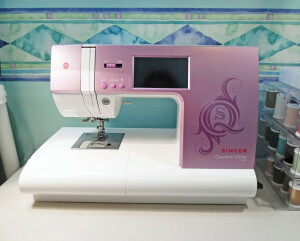 Some will also allow you to trade in an old sewing machine, putting its value toward a new one. Weigh the pros and cons and decide for yourself where to shop and what to buy. It’s a good idea to buy a trolley if you’re attending classes regularly. Not only will it make it easier for you to lug your machine around, but it will protect your machine from getting bumped and bruised in the trunk of your car, and it will keep it dry if it’s raining. However, you need to be sure you pick the right kind. There are trolleys available for sewing machines, sergers, embroidery machines, and scrapbooking supplies. Each one is different, so don’t assume just any trolley will work for your sewing machine. Get the right kind! Double-check the measurements to be sure your machine will fit, too. Most sewing machine trolleys have wheels and a telescopic handle, just like a carry-on suitcase, to make it easier to carry your sewing machine to class. 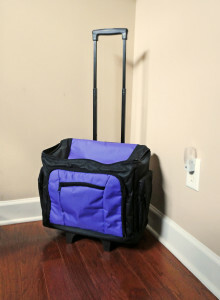 Be sure the one you pick is well-padded and has straps to secure your sewing machine during transit. It should have pockets, too, to hold the electric cord and foot pedal. If it has room for your sewing box or any extras, that should be considered a bonus. If you sew, you need a way of marking your fabric. Notches, dots, darts, buttonholes, and such must be transferred from your pattern, and there are other occasions, too, when you may need to mark your fabric, such as when turning up a hem, or sewing a tricky seam. Not all fabric marking methods are created equal, however. Here’s a quick rundown of the pros and cons of the most popular types. 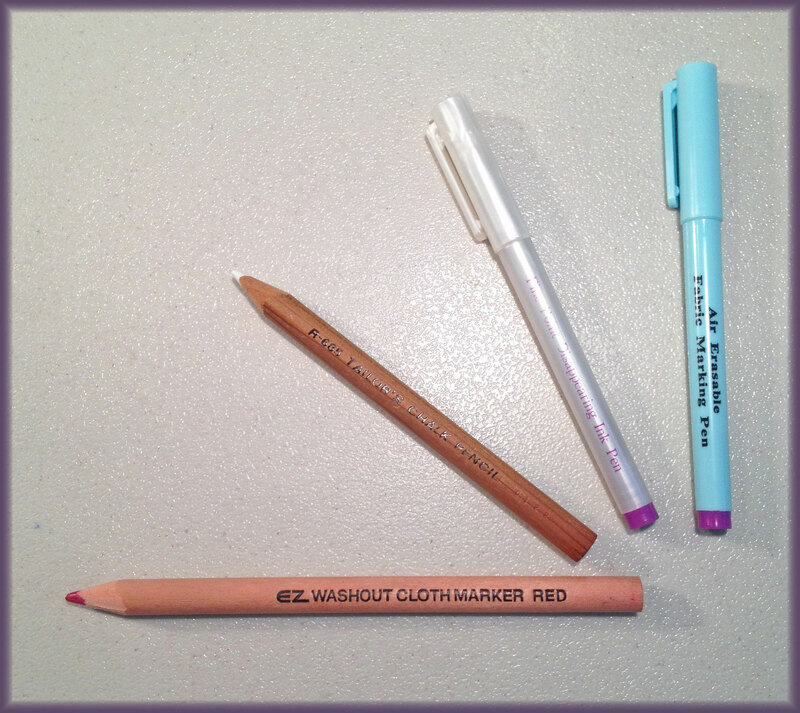 • Air-Soluble Fabric Pen: The best type of marking tool I’ve found is an air-soluble fabric pen, which has purple ink that fades with exposure to air. This means the marks will disappear on their own within a day or two. The fine-tipped version is very accurate and great for marking notches, dots, and the like. Unfortunately, they aren’t appropriate for class, since any marks you make will be long gone by the time you return to class the following week. • Water-Soluble Fabric Pen: Since you can’t use a purple fabric pen for classwork, the next best thing is a blue pen, which only disappears when rinsed with water. Sadly, the fine-tipped version isn’t the best quality. It tends to be very pale and dry, requiring a lot of effort to make a visible mark. The thicker versions are easier to work with, but they’re not as accurate. • Chalk Pencil: You could try a marking pencil, but be careful. Tailor’s pencils are made of dry chalk, which easily brushes off your fabric without leaving a permanent mark. They’re hard to find, though. The kind that’s commonly found at the fabric store is made of an oily chalk, which can stain some fabrics. Use with caution! • Frixion Erasable Pen: A newer option that’s gaining popularity is the Frixion erasable pen. It’s not intended for marking fabric, but many use it for sewing. It comes in lots of colors and is available in a variety of sizes. To make the marks disappear, simply press them with a warm iron. There are a few caveats, however. It’s easy to accidentally erase your marks while pressing a seam. Whereas heat makes the ink vanish, cold will cause it to reappear. This may be an issue in cold weather. With certain fabrics, the ink doesn’t entirely disappear when heated. It may leave behind a tan or white stain. To be safe, test any marking method ahead of time, to be sure you won’t regret using it. Many sewing machines come with a free seam ripper. They’re a necessary item, meant for helping you tear out stitches that need to be redone. The problem is, the free seam rippers (and many of the inexpensive ones you can buy) are too small. They’re just two or three inches long, very skinny, and made of a slick plastic, which means they’re uncomfortable to hold, hard to use, and easy to drop. 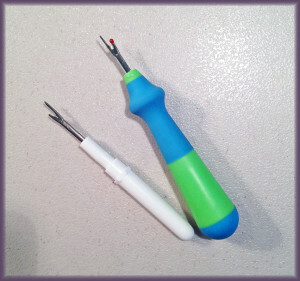 A better option is an ergonomic seam ripper, which is made of a thick, rubbery material that’s easier to grip. There are several different brands and colors available. (My favorite can be found at Hobby Lobby.) Before buying, check to be sure the blade is a smaller size. Some that have an extra-large handle also have an extra-large blade, which can make it harder to rip out small stitches. Now let’s look at a few sewing items you should avoid altogether. When a single spool of Coats & Clark costs $4.95, you may be tempted by the generic three-pack for $1. It really isn’t a good deal, though. Cheap thread is thin and prone to fraying and breaking, which means you’ll waste time re-threading your sewing machine and redoing your seams. Also, bargain thread can be very linty. The fibers will come loose as you’re sewing, clogging your sewing machine’s innards with colored fuzz. This can cause skipped stitches, dire grinding sounds, and other problems. The lint has to be removed by a professional, which will cost you $80 and up, depending on your sewing machine. Does that cheap thread still sound like a bargain? 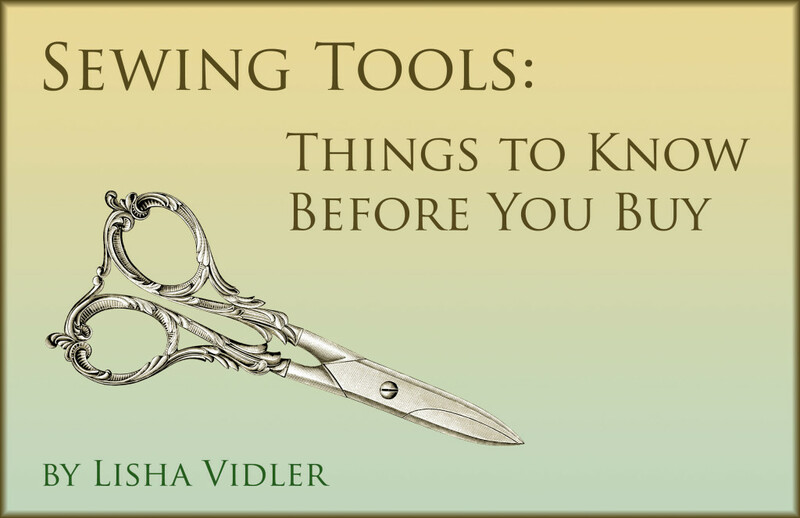 Scissors and shears may all seem alike, but this is one area where quality is important. First of all, you want shears, not scissors. Yes, there’s a difference! 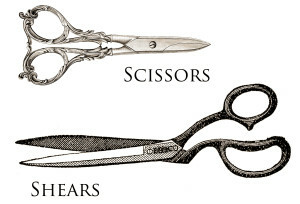 Scissors are reversible—both handles are shaped the same, and the blades run straight down the middle. 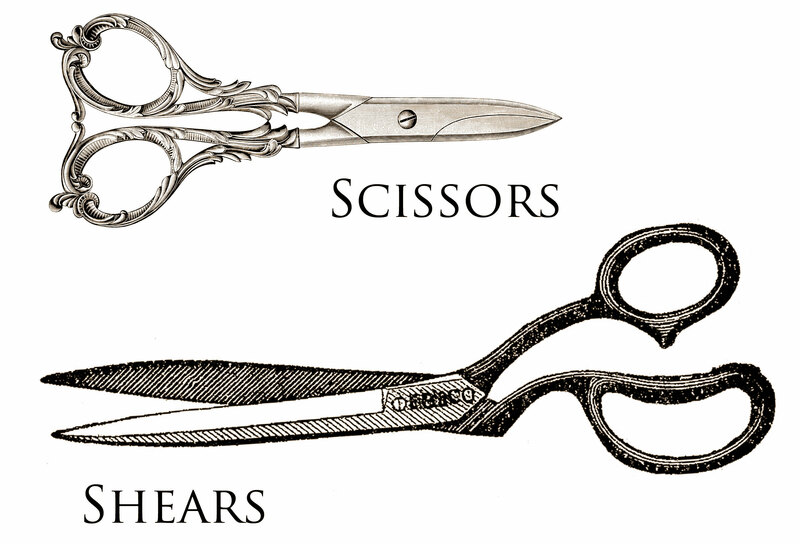 In contrast, shears have handles that are shaped to fit your hand—the bottom handle is long and skinny, to hold your fingers, while the top handle is short and round for your thumb. Also, the blades are offset, so they can cut fabric without lifting it too far off the table. Use full-sized shears for cutting fabric. Small scissors work best for snipping threads, trimming seam allowances, and making clips or notches. As with thread, don’t cheap out. Inexpensive shears will be harder to use. They may cut unevenly and they probably won’t be sharp enough. Dull shears will chew up your fabric! High-quality shears, on the other hand, will slice through fabric like a warm knife through butter. They should open and close smoothly, too. I recently bought a pair of bargain scissors at the fabric store, simply because they were my favorite color. Turns out, they’re not very sharp and the blades stick when you try to cut. I wouldn’t dream of trying to cut fabric with them! I’ve banished them from the sewing room. If you’re serious about sewing, invest in a good pair of shears and don’t use them for anything but cutting fabric. (I prefer spring-loaded shears, which work effortlessly.) Keep them sharpened, too! You can buy hand-held sharpeners at any fabric store, but a professional sharpening is better. Looking for more sewing advice? Check the Sewing Basics menu for a list of beginner-friendly articles, or try the Tutorials for more advanced help.